If you want to immerse yourself in the capital of India, nothing will get you there quicker than visiting Chandni Chowk in Old Delhi. Created in the 17th century as part of Shah Jahan’s vision for the city, a canal once ran right through the centre of this crowded trading centre. It’s still home to rickshaws, hawkers, sights and sounds that create the kind of sensory overload that lets you know you’re alive. You can buy almost anything at Chandni Chowk, but be prepared to bargain hard and remember to enjoy the experience. It’s all part of the fun! If jewelry is what you’re after, you can find the best silver at the Dariba Kalan bazaar. If you have enough time, craftsmen may be able to even create a design just for you, or give them some semi-precious stones that you pick up in Chhatta Chowk bazaar and see what they can do with them. Whether you’re searching for the finest Benares silk from Varanasi or some traditional Khadi cotton, head to Katra Neel bazaar. Expect to rummage through lots of textiles to find what you’re looking for, but you’ll be given plenty of chai and a friendly smile as you do. If you’ve got your eye on some fine embroidery, the intricate zari work that uses fine threads of gold and silver can be found at Kinari Bazaar, making it the perfect place to pick up a special saree. For household goods, or perhaps that hairdryer that you forgot to pack, visit Bhagirath Palace. Far from a royal residence, this is the largest electrical goods market in Asia, so if you can’t find what you’re looking for here, chances are it can’t be bought. Finally no visit to Chandni Chowk is complete without sampling some spices. Selling everything from the finest saffron to every type of legume imaginable, the Khari Baoli market will excite your sense of smell in ways you’d never imagined. 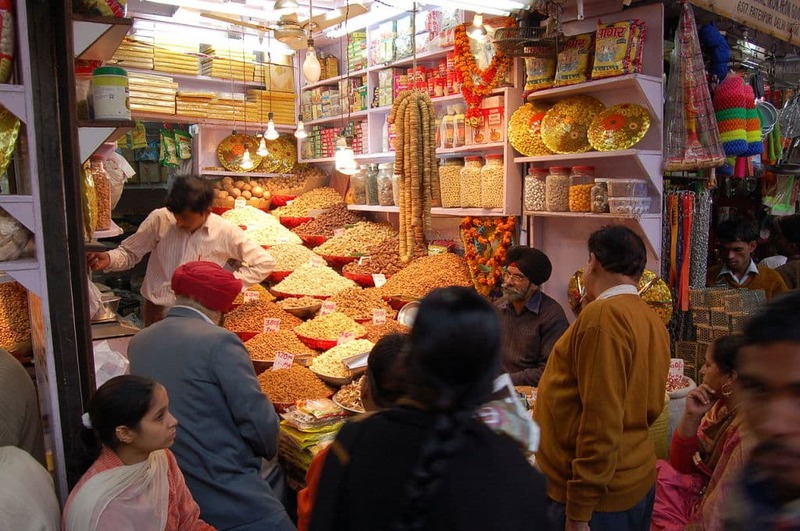 No doubt you’ll work up an appetite with all that shopping, so don’t miss some of the tastes of Old Delhi. 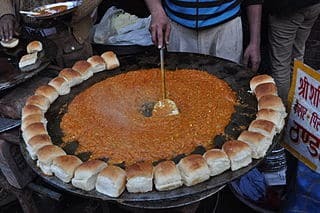 Famous for it’s street food you can find succulent kebabs, fragrant biryanis and pav bhaji on every street corner here. A popular spot is Karim’s, where the mutton is not to be missed. But if you’d like to be dazzled by the open ovens, then head to Parathewali Gali, which literally means ‘paratha maker street’, where you can find the softest of flat breads stuffed with some delicious fillings. Once you’ve had your fill, you’ll be ready to catch the rest of the sites of Old Delhi. Nearby is the spectacular Jama Masjid which is one of the largest mosques in the world, capable of holding 25,000 people. It also offers one of the best views across Old Delhi from its minaret. Of course the imposing Red Fort is also nearby. 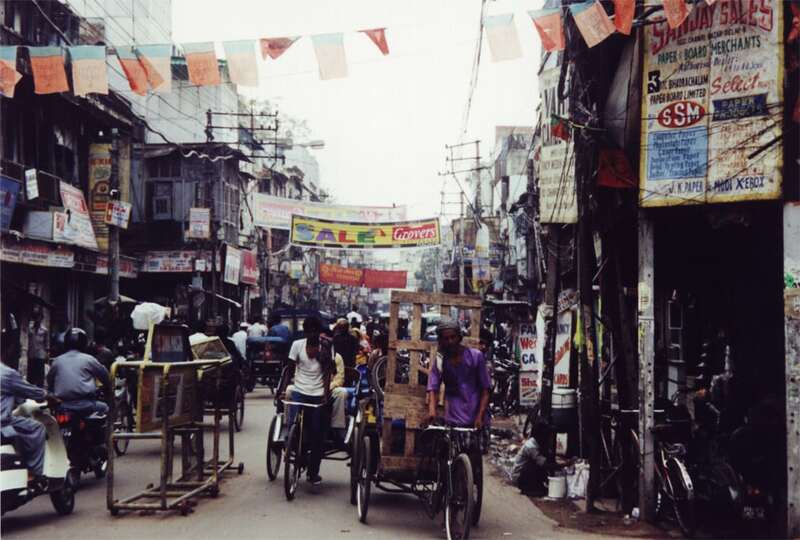 Old Delhi is one of the quintessential sites of the Indian capital. It’s not to be rushed, but to be experienced. While it can be a lot to take in, just succumb and you won’t regret it.